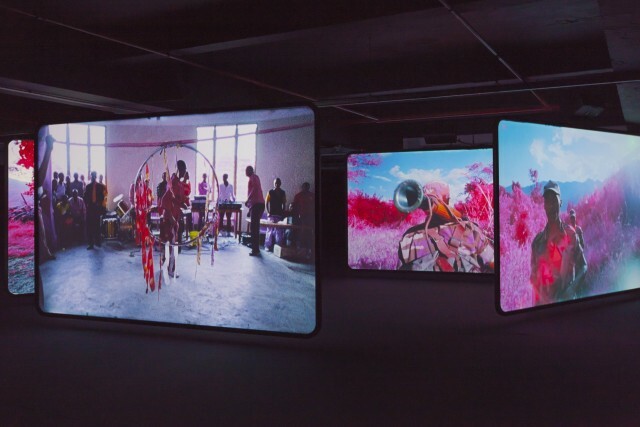 Bringing Richard Mosse's profoundly affective exhibition from the Irish pavilion at the Venice Biennale to London for the first time, Edel Assantiand The Vinyl Factory have let true darkness enter the depths of the Brewer Street Car Park. Both mesmerising and sickening, a 40-minute film and a series of photographs portray the Democratic Republic of Congo in a disturbingly clever way. The film, shown in a disorientating dance across eight, huge screens, is unquestionably a tour de force of immersive filmmaking, but Mosse's genius lies in his use of Aerochrome film to document his time spent embedded in both rebel and paramilitary Congolese forces. Invented by the US military to pick out infrared light normally invisible to the naked eye, the film turns green tones to red, saturating the footage with a pink that becomes nauseating as the sinister story unfolds. It is an apt transformation for a country indelibly stained by decades of bloodshed. Beginning with blue skies and open water, the film proceeds at an uneven pace, tracing the narrative of the war-torn country across the dispersed screens. Unflinching tracking shots capture a full spectrum of life there: sublime, sweeping landscapes are interspersed with images of prosaic intimacy. Dreamlike, we follow the militia along worn jungle paths, find midwives in refugee tents, accompany priests up church aisles, roll corpses over by the roadside, and watch persistent hands methodically pull apart a lump of dough, flesh-like in its pink disguise. Vivid dreams sometimes have an uncomfortable reality that seeps into the experience of the day. This unnerving quality pervades The Enclave; Mosse notes that 'the real is only effectively communicated through shocks to the imagination, precipitated by the Sublime'. It is a sad irony that in jolting this remarkable first-hand footage into the realm of the surreal, the artist makes us acutely aware that for the troubled DRC, this is a nightmare that will not disappear in the light of day. 'Richard Mosse: The Enclave' is at Brewer Street Car Park, London, until 26 April 2014.